Place the tomatillos along with the garlic cloves and chiles in a pot and add enough water to cover. Place over high heat and bring to a boil. Reduce heat to medium and simmer for about 10 minutes, or until the tomatillos change in color from bright green to a pale green, are cooked through, and are soft but are not coming apart. Transfer the tomatillos, garlic, chile (you may want add only 1 chile at first), and 1/2 cup of the cooking liquid to a blender and puree until smooth. Incorporate the cilantro leaves, onion and salt and process again. Taste for salt and add more if need be. Also taste for heat, you may add the other chile in pieces until you reach your desired heat level. In a medium saucepan, set over medium heat, pour the oil. Once hot, pour in the salsa verde, bring to a simmer and cook for 6 to 8 minutes until it thickens a bit and deepens its flavor and color. Turn off the heat. Allow to cool to room temperature and serve. Or, once it cools down, you may store it in a closed container in the refrigerator for weeks. How well does the finished product freeze. Does the tamal casserole freeze well? I started making this salsa and follow the direction exactly. It comes out amazing. Before this all my salsas were a fail :(. Especially the green one. I never got the ingredient quantity right. I’m going to try your other salsa recipes! So excited to hear, Maria! In my house, I get made fun of because after I make the salsa verde, I ladle the cooking liquid into a mug, add a dash of salt and pepper, and enjoy. I’m essentially drinking vegetable broth, but the tomatillos give it a mild tartness, and maybe I’m getting a little vitamin C as well. Anyway, I like it, so as long as I make tomatillo salsa, I’ll keep doing it. HAHA!!! Amazing! Yes, I am often guilty of drinking the sauce before I am even finished! 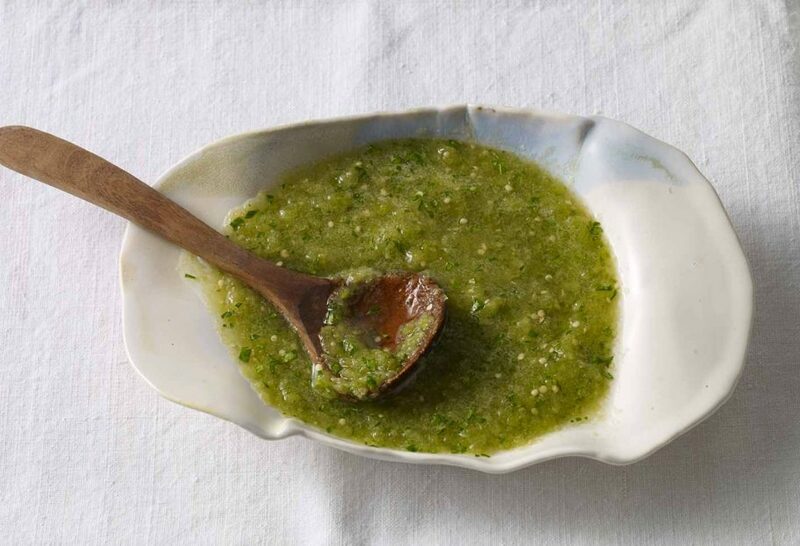 This “salsa verde” recipe calls for boiling the tomatillo and chili. Don’t you think that it would have better color and flavor charring them on a comal?